Dave Foy is a well-known E-Teacher and the founder of Design Build Web, training novice users how to build websites and sales funnels with Elementor. On our weekly podcast episode, he describes the process of creating a successful funnel and recalls his days as a primary school teacher. It is no secret that Dave Foy works closely with Elementor, creating excellent tutorials as well as teaching non-coder designers and non-marketers how to use WordPress and Elementor to build websites. In 2016, after years of experience of training web designers, Dave formed Design Build Web, creating online courses and training. His training is delivered via free YouTube videos, webinars and 2 premium online courses – No Stress WordPress and No Fear Funnels. 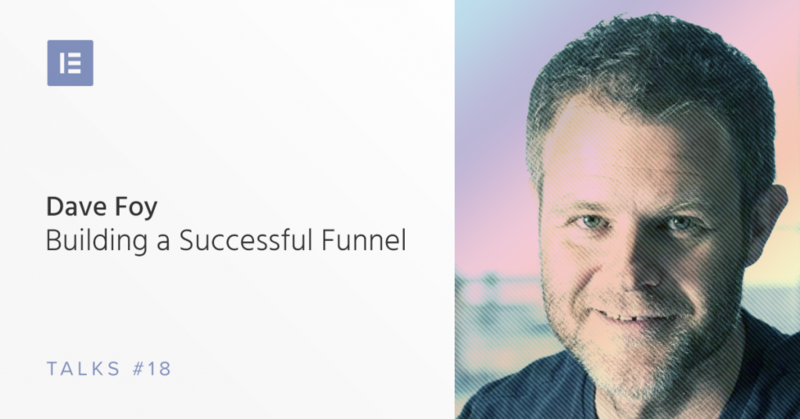 For the benefit of our listeners who may be new to the field of marketing, we asked Dave to explain what is a Funnel. In his words, “It is a path when taking people from attracting them to the site in the first place, along the way to ultimately becoming a customer, and then becoming a loyal customer. A lot of people think that funnels stop at the sale, but actually, the funnel process is developing repeat customer and loyalty, and ultimately actually having those customers become marketers for the company because they’re out there recommending you and spreading the word as well. A funnel is simply just, it’s where you’ve mapped out the kind of the ideal path that your potential customers are going to take, to kind of take them along the journey to ultimately becoming a customer. The way that I teach is, once you’ve defined that problem, and what the desired outcome is, what the desired sort of success looks like for that customer, is to think about how you’re actually going to attract them in the first place. Which is basically with lead magnets. Either something like … It could just be that something as simple as like a really little mini-course or a checklist PDF or something … It can be something really, really simple. Actually, the best lead magnets are the ones that somebody can kind of download your PDF and get in a win straightaway. Huge e-books generally don’t perform very well, because it’s just too much of an investment in time. Find that and build out that funnel first. What that process would look like is, firstly defining that clear problem, actually talk to customers, go and actually interview them, go and find out in their own words how do they actually describe their problem, don’t just assume. Then create, I mean this could be for any business really, but create something that is going to attract them and give them a bit of a win. I mean there is this concept of the problem awareness scale. Partly one of the things that a good funnel will do is, as people go through the funnel, you’re helping them to sort or solve their problem. At the start, your potential customer when you attract them with this particular lead magnet, which is promoted on a landing page on your site, then that that potential customer might not even be aware that they have that problem, or they might not have identified it clearly enough to even know where to look for a solution. Partly that stage, that’s the job. Create a landing page, it can be very, very simple. Elementor makes that makes that super, super easy. Yeah, I mean with the new, the new Popups feature is awesome. Dave started his career in the nineties as a primary school teacher in his native town oh Hull in the UK, teaching children of age six to 11. As he tells us, teaching was his dream job. However, the bureaucracy he had to struggle with and the way the government treated teachers at the time made him leave his job. This was when he decided to learn web design basically from scratch. His first web design jobs were websites for schools that he worked with. “It was on an 18-month cycle after I left teaching. About every 18 months or so, I would get this incredible urge to teach again. Just think I’m… I just used to think I’m kind of wasting a talent that I have. Something that I’m kind of making websites for clients and I really, really thoroughly enjoyed it. But kind of felt that, that sense of teaching people and helping them transform and kind of just get better, become better, achieve what they… Achieve their goals. I used to regularly kind of go back into schools and I’d contact head teachers again at the schools. ‘Do you mind if I come in and do a little bit of teaching?’ And I used to very, very quickly think, ‘Oh no, I’m not going back into the classroom. Definitely not.’ But it was around about 2016, it was middle of 2016 when I suddenly realized I’ve got to teach, I have to teach, there is as just something that just kept coming back to me. It was just this thing is like a wave. And I thought, well actually, I’ve spent the past 16 years informally teaching web designers. I would partner on projects with graphic designers, particularly. Guys who were awesome designers, they could use Illustrator, Photoshop, incredible designs, but had just real trouble realizing actually being able to create them, being able to create those kinds of sites. I used to be the guy they have to turn to, to actually build these layouts and websites for them based on Photoshop layouts and things like that. “When I first got into web design, I remember sitting with my partner and saying to her that, ‘I’m going to become a web designer. I want to build things. I want to make things for people, but I am not getting into marketing.’ I was absolutely adamant marketing. And this was a long time ago now, but, ‘I’m not getting into marketing that’s for other people, that’s for a certain type of person. And that’s definitely not me.’ And I resisted, which is ridiculous now. I mean marketing and websites, they’re just that this … There should be no distinction between them at all… It’d probably be helpful to explain to you how I actually came about teaching this course, especially for somebody who 15 years ago promised never to be ever go near marketing at all. It was from starting actually just teaching, when I started this teaching pure web design stuff, pure how to build websites kind of thing with WordPress and Elementor. And my process of not being interested in marketing whatsoever, to doing my work with my friend in our agency, in our partnership, starting to realize that there is firstly, there is no separation. Thank you so much for having me as a guest. Really enjoyed it! Dave is a rock star. Seriously, he’s a brilliant teacher who gives you the tools you need to grow your business. I’ve participated in his No Fear Funnels course and I could not recommend it more highly. A great investment! Would love to see Elementor do more with Funnels in mind! Analytics, improved form features, etc. Dave rocks when it comes to teaching. He really does. His No Stress WordPress course is unparalleled. I develop custom CRM as part OF my services. Im an Elementor fan when it comes to websites and e-commerce…until now. I never realized that i could use Elementor for sales funnels. Thank you very much. You never stop learning on this job, thats why i love it. Amazing guidelines to follow and create funnels website in elementor. Grammar error at the end of this sentence. Other than that great blog! ““I sound like a broken record, but when you’ve defined one specific problem for your customer. If you’re a real estate agent, the problem isn’t our potential customers want to buy property, but that has just way, way too they”. If this was exactly what he said at least add a [sic] to complete the sentence.